1. Love Jesus and put Him FIRST. If you expect and want your daughter to make Jesus her #1 priority, then you must make Him your #1 priority. Your daughter will learn by your example. Jesus has placed you into your daughter’s life to disciple her and teach her how to make her relationship with Him #1. You will have to help her in this. This means making church/student ministry #1. Academics, sports, etc. are all great things, but you cannot put them before Jesus and the things of Him. You may even tell your daughter Jesus is #1, but if your actions don’t match up, she will be able to tell. Teach her at her young, impressionable age to put Him FIRST and everything else behind Him. You won’t regret it. 2. Don’t be her best friend. Your daughter has plenty of friends. What your daughter needs from you is a parent. This means that sometimes, you will have to tell her, “No,” to hanging out with her friends, dating that guy, wearing that outfit, etc. because that is what is best for her. She might not like you at the moment, but she will thank you for it later. Mom was my parent first, but we still had a great friendship, especially in my college years. 3. Be involved in her life. Your daughter might act like she doesn’t like it when you sign up to go on that church trip or show up at the school pep rally, but she will appreciate later on in life. You need to be involved in her life. The more involved you are with her church activities, sports, etc. the more opportunities you will have to get to know her friends, the guy she likes, etc. 4. Listen to her. No one could listen to me like my mom did. When I would come home hurt because I had been left out or frustrated over a grade, Mom listened to me go on and on… and on and on…. about it. Mom let me get out my frustrations, hurts, disappointments, joys, etc. before she gave her 2 cents. She was my sounding board. Also, I knew when I told Mom something that it wouldn’t go past her. Keep your daughter’s trust. Don’t go gossiping about whatever she told you (unless absolutely necessary, of course). All in all, remember you have 2 ears & 1 mouth (I know, it’s easier said than done!). 5. Be neutral. Girl drama WILL come, trust me. When it does, be there for your daughter to sound off to and be a shoulder for her to cry on. However, don’t be an instigator. If your daughter is hurt, then let her hurt with you. If your daughter is in the wrong though, let her get her feelings out, but then gently and with love help her see her wrong. This is part of discipling her. Show her how to make amends with her friends, how to forgive, and how to ask for forgiveness. 6. Be her #1 fan. 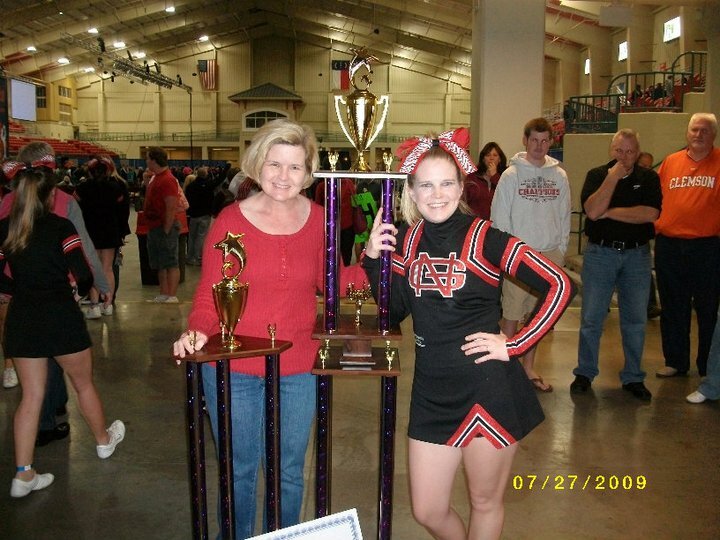 Mom was there for every football game I cheered at, every competition I cheered at, and everything in between. I knew I had Mom’s love, support, and encouragement, and that meant the world to me. It will mean the world to your daughter too. 7. Show her some grace. Just like you are not perfect, your daughter isn’t perfect either. Love her like Jesus does and show her some grace (don’t worry, I told her to do the same with you). 8. Have girl time with her. Want your daughter to open up? Take her out for her favorite ice cream, take her to lunch, take her shopping for a new outfit, etc. Do something you know that you and your daughter will enjoy together. When y’all are having fun together, she will be more likely to open up and share the details of her life with you! Jesus has given you a precious gift in your daughter. Right now, you have a fragile teenage girl who desperately needs your love, guidance, and support, but one day, that teenage girl will hopefully turn into a woman who can be a friend who comes to you for advice when she’s cooking her first dinner for her husband or when her baby won’t stop crying. I am sure these teenage years are tough, but keep persevering. Follow Christ and His lead, and He will guide you in raising your daughter. Remember, this relationship has 2 imperfect people in it, so it will never be perfect. However, I can tell you from experience, that my relationship with my mom definitely got better with age. Like I said, I am NO expert. Boy or girl, I am going to need all the help I can get as I learn to raise the child that is growing in my womb. I just wanted to share some things that I saw my mom do throughout the years that I feel really helped me as I grew up and really helped our relationship. I will be praying for you and your daughters that these teen years will draw you closer to each other and to Christ! Like I said, Mom was ALWAYS there for me- Even right after her biopsy at Duke. Previous postMothers & Daughters (Part 1). Casey, this is a great blog and every word of it is correct. Great advise! You are going to be an awesome mom! You had the best teacher. I am so excited to see you sharing your wisdom.